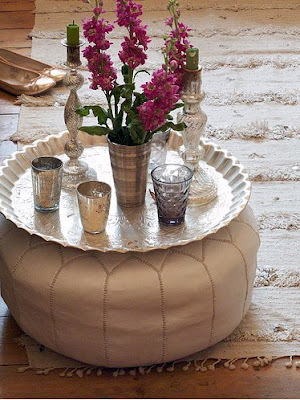 You may have done something like this - sweated and puffed to make yourself a no-cost Moroccan ottoman and now you would like a Moroccan tray to put on top so that it can look like the one above, but the tray costs more than what you spend on food in a month. In such instances, I hop over to Copy Cat Chic and have Reichel look for a cheaper version. Reichel regularly finds affordable knockoffs of high-end products. She found a tray similar to the one I admired for less than one-third the price. 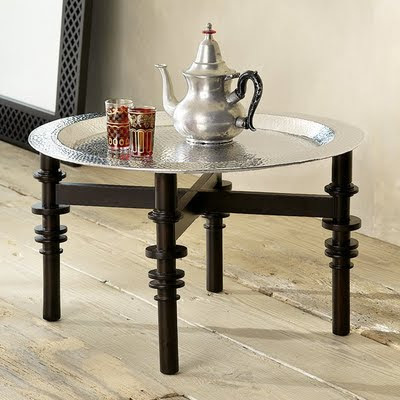 And she also found this, West Elm's hammered tray and medina stand. But what would I do with it? Any hammered tea tray owners out there? Do you use it as a coffee table? Side table? Frisbee? Where on earth would I put this and a Moroccan pouf? Why do I have such a weakness for cute little tables? Great! I love a bargain! 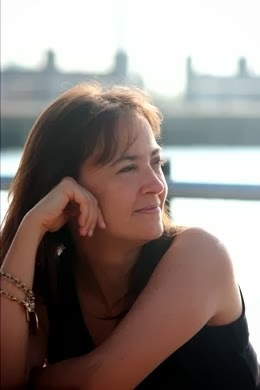 I just added Copy Cat Chic to my reader. i will definitely check out copy cat chic...it seems like it would be right up my alley (you know, chic and all).